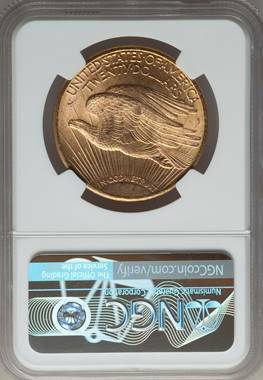 The San Francisco Mint struck in excess of 2.1 million double eagles in 1910, although this issue served in the foreign trade and few high-end pieces were preserved for numismatists. In MS65, the date is moderately elusive but collectors can still be choosy for quality. Finer pieces are rare. 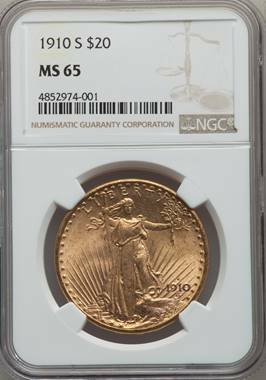 NGC and PCGS combined have graded 23 pieces MS66 or higher and trade in excess of more than $20,000. Listed at $5,620 in the CDN CPG, $5,500 in the PCGS price guide, $7,000 in the NGC price guide and $6,750 in Trends. Previous Previous post: Jay Taylor: Under “Basel III” Rules, Gold Becomes Money!